On an average day in Wyoming, energy companies drill nine new wells to pull methane gas out of the state’s coal beds. In 1995, the state had 427 coalbed methane wells. Now, the total is more than 21,000, and another 30,000 have been approved, according to Don Likwartz, supervisor of the Wyoming Oil and Gas Conservation Commission. The government agencies charged with overseeing this industry are having a hard time keeping up with the rush. Most of Wyoming’s coalbed methane drilling occurs in the Powder River Basin — 14 million acres of rolling plains in the northeastern part of the state. The U.S. Bureau of Land Management has leased 95 percent of its mineral rights in the basin to energy companies. The resulting new roads, power lines and pipelines all have environmental impacts. But most worrisome to landowners are the millions of gallons of water that developers pump out of the ground to access the gas. This water is often high in minerals and salt — each well produces an average of 20 tons of salt per year — and when wastewater spills or leaches into the ground, it can destroy ranchland and wildlife habitat. 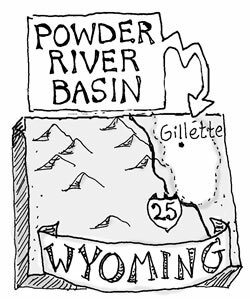 The wastewater is supposed to be regulated by state and federal agencies (HCN, 11/5/01: Wyoming's Powder Keg). But it has recently become apparent that many drillers have been operating below the regulators’ radar. In January, a survey by the state engineer’s office, which oversees water rights, revealed that less than half of the 217 coalbed methane reservoirs in one drainage in the Powder River Basin had the required permits. Energy companies were illegally using 125 unpermitted reservoirs to hold salty wastewater. Similar violations are probably occurring across the state, says Likwartz. "The struggle that we have is that we have not added personnel to deal specifically with reservoir control," says Harry LaBonde, deputy state engineer. Ranchers and environmental groups have been asking for enforcement and monitoring for years, but only in the last six months have legal decisions and administrative moves begun to tighten the reins. The discovery of the unpermitted reservoirs has prompted the state engineer’s office to ask the Legislature to allow for fining violators up to $1,250 per day. Currently, there are no penalties. The state engineer has also requested $150,000 to survey all of the state’s reservoirs. "There is no doubt that we are playing catch-up," says LaBonde. "But the state, and government in general, normally does not staff up in anticipation of development." Gov. Dave Freudenthal, D, has echoed the call for more funding. "For this development to proceed, it is critical that the state provide a sufficient regulatory mechanism to address and mitigate the effects of the development," Freudenthal wrote in a letter responding to the survey’s findings. "Especially given the importance of coalbed methane development to the state’s financial health." 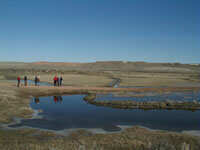 According to Likwartz, in 2004, coalbed methane generated about $144 million in tax revenue for the state. Over the next 75 years, the estimated 25 trillion cubic feet of gas under Wyoming’s soil could bring the state more than $10 billion in tax revenue. Wyoming’s Department of Environmental Quality, which issues permits for surface water discharge, hired eight new staff members in 2004 to deal with the twenty-fold increase in permit applications since 1997. "The current staffing levels are adequate to do what we need to do," says Todd Parfitt, the department’s program manager. Yet the department has only six field inspectors, who are responsible for the 900 permitted sites and also have to respond to all complaints. "There is no muscle or backbone behind the enforcement," says Jill Morrison of the citizens’ group Powder River Basin Resource Council. Federal agencies, such as the U.S. Army Corps of Engineers and the Bureau of Land Management, have tried to streamline the permitting process, but their laxness is coming back to haunt them in the courts. Under the Clean Water Act, the U.S. Army Corps of Engineers permits the discharge of water and dredge materials from gas drilling in any interstate rivers and their tributaries. In 2000, the Corps issued a statewide permit that pre-authorized gas companies to go about their business without applying for individual permits. The Wyoming Outdoor Council sued the Corps, and in early January, U.S. District Court Judge William Downes declared that the general permit is illegal because it did not consider the cumulative environmental impacts of coalbed methane development. And last August, the 10th Circuit Court came down hard on the BLM. The court determined that three BLM leases to Pennaco Energy Inc. in the Powder River Basin should have specifically looked at the impacts of water disposal methods used in coalbed methane drilling, rather than assuming that the methods would be the same as for traditional oil and gas extraction. BLM staff will now have to review 417 other leases, and possibly add environmental protections, or even buy out the leases. "Certainly, things are changing to fit new situations," says Richard Zander, associate field manager for the BLM’s Buffalo office. "And we’ve adapted to fit those changes." The author is an intern at High Country News.